Back Issue of the Week: The Punisher Meets Archie Direct Market Edition (August 1994). The comic fans couldn’t believe was going to happen…and then still couldn’t believe it once it came out! A precursor of sorts to more recent comics like Archie Meets The Ramones or Archie Vs. Sharknado , this crossover between the family-friendly teen shenanigans of the world of Archie with Marvel’s dark ‘n’ gritty gun-toting vigilante shouldn’t have worked, but somehow it did! Legendary Marvel artist John Buscema handled the Punisher-side of the art chores, while classic Archie artist Stan Goldberg took on that side of the book, and inker Tom Palmer provided the overall finishes, bringing a unifying look to the art job that didn’t sacrifice the visual qualities specific to each character. 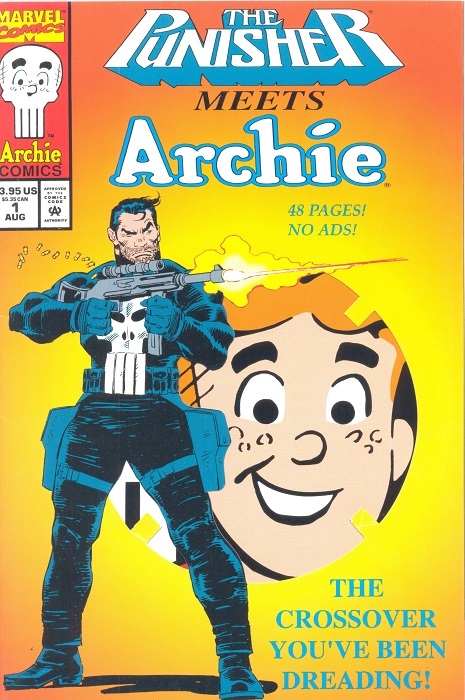 Of note is the die-cut cover on the direct market edition, pictured above, with Archie peering through the target sight hole, evoking the Punisher’s first appearance from Amazing Spider-Man #129. In contrast, the “regular” version of the comic (titled Archie Meets the Punisher ) was more in the style of the typical Archie Comics gag cover. And now, over twenty years later, this still remains one of the champion oddball crossovers of all time! This entry was posted in Back Issue of the Week on October 6, 2016 by Mike.